Recall the locus definition of a parabola (illustrated here if you need a refresher). Well, imagine spinning this parabola 360 degrees about its axis (of symmetry). Doing so yields a 3D solid called a circular paraboloid of revolution. Interact with this applet for a few minutes. Be sure to slide the Slide Me! slider completely once before messing around with the other sliders! Note: Point P is a point that lies on this solid. Move it wherever you'd like. After doing so, answer the question that follows. To explore this resource in Augmented Reality, see the directions that appear below the applet. A circular paraboloid of revolution is a locus (set of points that satisfy a condition or set of conditions). How would you describe this locus? 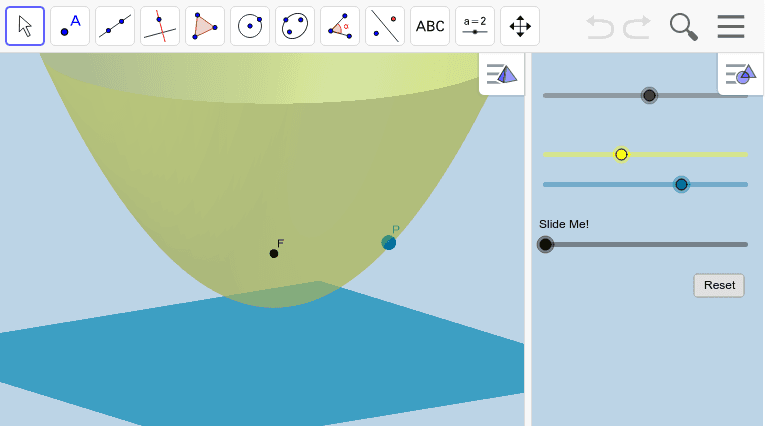 ﻿1) Open up GeoGebra 3D app on your device. 2) Go to MENU, OPEN. Under SEARCH, type g3uusvay. 3) The xcoord slider controls the x-coordinate of point P. The ycoord slider controls the y-coordinate of point P. The yellow e slider controls the opacity of the paraboloid. The blue i slider controls the opacity of the (directrix) plane. The a slider stretches (or compresses) the paraboloid vertically (with respect to z). The slider named d provides the animation. Set the boolean variable n equal to "true" if you want to see the 2d-parabola = cross section of the paraboloid of revolution and vertical plane containing P.